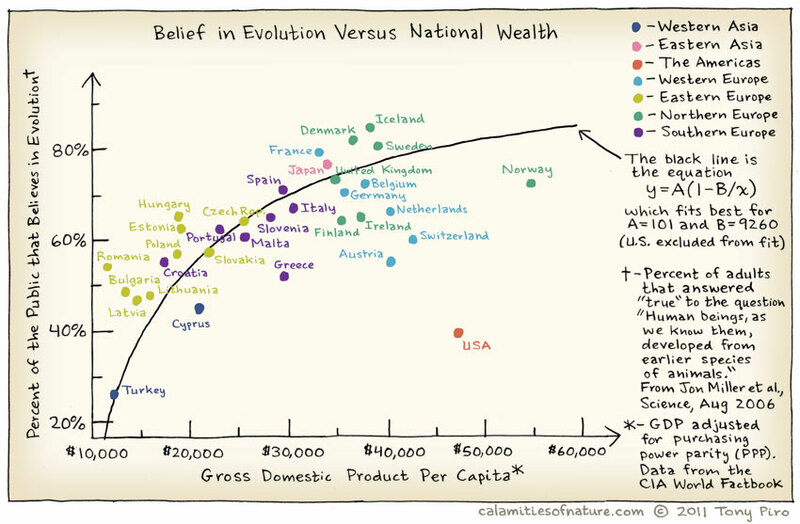 def shepherd: Belief in Evolution vs. National Wealth: Why Does The US Not Fit The Trend? 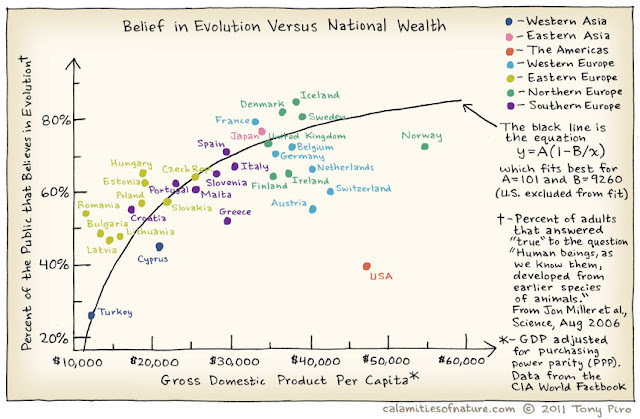 Belief in Evolution vs. National Wealth: Why Does The US Not Fit The Trend? The United States is an odd bird, clearly. This graph reminded me of a post on PZ Myers' Pharyngula blog in which he discussed an international poll showing the US as being near dead last in acceptance of evolution (just above Turkey, another country with a distinct fundamentalism/modernism issues). What, pray tell, could cause the US to remain such an outlier? 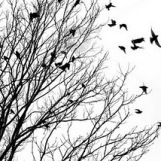 Second, the evolution issue has been politicized and incorporated into the current partisan division in the United States in a manner never seen in Europe or Japan. In the second half of the 20th century, the conservative wing of the Republican Party has adopted creationism as a part of a platform designed to consolidate their support in southern and Midwestern states—the "red" states. In the 1990s, the state Republican platforms in seven states included explicit demands for the teaching of "creation science". There is no major political party in Europe or Japan that uses opposition to evolution as a part of its political platform. Nigel Barber, in Psychology Today, asks if Atheism will eventually replace religion, as research shows that atheism "blossoms amid affluence where most people feel economically secure." It seems that people turn to religion as a salve for the difficulties and uncertainties of their lives. In social democracies, there is less fear and uncertainty about the future because social welfare programs provide a safety net and better health care means that fewer people can expect to die young. People who are less vulnerable to the hostile forces of nature feel more in control of their lives and less in need of religion. Hence my finding of belief in God being higher in countries with a heavy load of infectious diseases. These findings are not surprising, but his piece does not acknowledge the fact that the US, a developed country where most have access to shelter, healthcare, and education, remains extremely religious (and relatively anti-evolution). Unfortunately, in the US, there appears to be no level of affluence and comfort capable of decoupling religion and politics, despite constitutional assurances explicitly requiring it. It would probably be interesting if you could split up the USA into New York/Califonia and the mid-West/Bible Belt. I bet then USA won't be so much of an outlier on this chart. I second Zach's comment: it'd be really cool to see the US broken up by state. Sometimes it can be difficult to understand mortgage speak. It's important to make an effort to understand everything, anyway. Thanks for these tips! Thanks for the chart. It really made a lot of help about domestic gross to our nation. This is a great reference. Not to mention your cost of living. Owning a home has a lot of responsibility. One of the major problems in America today is the mortgage. If you find yourself unable to pay this, you may want to seek help. los angeles probate loan can give 10 times more profit based on the movement of the account. These green buildings are awe inspiring. First they are eco-friendly and they are energy efficient. They will help you incurr tax breaks. Looks like US is off-track on that infographic. I have shared this post with my accountant adelaide friend and he believes evolution. Based from the graph, he is at par with other people in Europe.